In our ongoing effort to make StogieGuys.com as entertaining and reader-friendly as possible, each Friday we’ll post a selection of quick cigar news and stogie-related snippets. We call ‘em Friday Samplers . Enjoy. 2) In related news, it was reported yesterday that over 100 pubs in Northern Ireland have gone out of business since the government imposed a smoking ban last year. Around seven percent more are expected to close in the next two years. 3) A “substantial number” of boxes of counterfeit Cohibas, Montecristos, H. Upmanns, and Romeo y Julietas were recently confiscated in Key West. 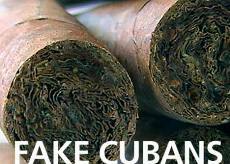 This is a good reminder to read up on how to spot a fake if you’re planning to purchase Cubans. 4) Inside the Industry : Camacho is increasing distribution of its limited edition Scorpion and Diploma vitolas. Altadis sold 3.16 billion cigars last year. Newman Cigars is adding a toro-sized maduro to its La Unica line. 5) Around the Blogs : Cigar Jack checks out a Perdomo Habano Corojo Maduro while Velvet Cigar smokes a Perdomo Habano. Stogie Review lights up a Romeo y Julieta Habana Reserve. Stogie Baby reviews a León Jimenes. 6) Deal of the Week : Haven’t tried the four and 1/2 stogie-rated CAO America yet? This CAO America Sampler is a great way to get to know the hot new blend. With six cigars, three sizes, and free shipping, it’s good deal. Get yours here .